There was reports of clashes between fans at full time. West Ham are through to the last eight. WEST HAM REACHED the quarter-finals of the EFL Cup as they beat Chelsea 2-1 on Wednesday, although the tie was the latest game at London Stadium to be marred by unsavoury scenes in the stands. 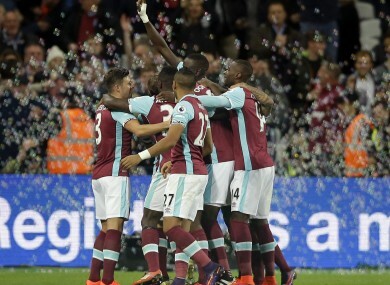 On a night when Slaven Bilic’s men finally seemed at home on the pitch in unfamiliar surroundings following their move away from Upton Park, goals from Cheikhou Kouyate and Edimilson Fernandes clinched victory. Roared on by a vociferous crowd, Kouyate crashed a glorious header into the net as both sides attacked in a thrilling first half. Fernandes’ storming strike – his first goal in English football – doubled West Ham’s advantage shortly after the break, with their teething problems at this new stadium suddenly appearing a thing of the past, although off the pitch stewards struggled to keep rival fans apart and missiles were thrown. With issues at the London Stadium regarding the segregation of home and away fans, there had previously been disturbances in Premier League fixtures against Watford and Middlesbrough – leading West Ham to stamp down on some supporters and outline a plan to tackle the trouble ahead of this fixture. Antonio Conte’s Blues won the teams’ early-season Premier League clash 2-1 at Stamford Bridge, but, even with captain John Terry back from injury, they could not get contain the Hammers, Gary Cahill pulling one back with the last kick of the match shortly after Eden Hazard had struck the frame of the goal. The returning Terry flicked an early Willian corner over, and the Brazilian then contributed a fine flick to set N’Golo Kante away into the area, with Darren Randolph standing up to make a firm right-handed stop. But, after 11 minutes, West Ham led through a stunning opener. Mark Noble’s cross from the left was deep and found Kouyate just inside the box, but the Senegal international rose to direct a magnificent header beyond Asmir Begovic into the far corner. With the noise levels cranked up another notch, the hosts sought a second; almost finding it as Michail Antonio squeezed a low shot narrowly wide after Dimitri Payet tumbled under pressure from Kante. Randolph was soon worked again, though, and did brilliantly to tip Nathaniel Chalobah’s ferocious drive over the crossbar. West Ham remained a threat on the counter through the energetic Antonio, but his measured centre was turned off target by Manuel Lanzini, before Begovic parried Payet’s free-kick from a similar position wide on the left. While the Chelsea goalkeeper made another impressive save as Pedro Obiang connected sweetly with a strike from 25 yards, Michy Batshuayi sliced horribly over in front of goal at the other end, and Oscar stabbed a tame effort just past the post. After just three minutes of the second half, though, West Ham got their second. Payet looked certain to score from Antonio’s cross, but Begovic blocked superbly. However, Chelsea could not clear their lines and Fernandes took up possession on the right, cut inside onto his left foot and rifled across the keeper into the bottom corner. As Noble whipped a shot wide from distance, Conte responded by calling rested stars Diego Costa, Eden Hazard and Pedro from the bench. Oscar flicked Hazard’s delivery into the side-netting, before Willian dragged hopelessly off target after Costa had run in behind and held the ball up for his team-mate. Andre Ayew made his return from injury for West Ham in the closing stages and Hazard crashed against the apex of the goal from Costa’s pass. Costa then lifted a finish past the near post for Chelsea and Begovic saved from Payet again. Chelsea belatedly got their goal as Cahill smashed into the net from close range after Cesar Azpilicueta had failed to get a shot away amid a goalmouth scramble, but there was no time for an equaliser and the hosts secured a deserved win. Meanwhile, elsewhere in the League Cup tonight, Southampton beat Sunderland 1-0 at St Mary’s courtesy of a fine 20-yard curler from former Lille winger Sofiane Boufal, who was making his full debut. Email “West Ham dump Chelsea out as tensions flare at London Stadium ”. Feedback on “West Ham dump Chelsea out as tensions flare at London Stadium ”.